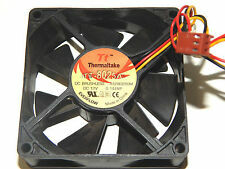 New Thermaltake 8 0mm x 25mm server grade long life 12V DC fan with 2 ball bearings (model # TT8025A-2B). Also included are a 3 pin to 4 pin molex adapter and 4 screws and 4 nuts. Bearing: Dual Ball. Fan Speed 1,300 ~ 2,500 RPM. LED Color Blue LED. Air Flow 32.92 CFM. Operation Temperature ----. Power Input. Bearing Type 1 Ball & 1 Sleeve. Modell / Model: TT-8025A, R128025SM. Der Lüfter ist gebraucht, geprüft und technisch ok. Daten / Facts: 12V / 0,14A. Manufacturer Part Number: A1888. Product Model: A1888. Manufacturer: Thermaltake Technology Co., Ltd. Fan Bearing Type: Sleeve Bearing. 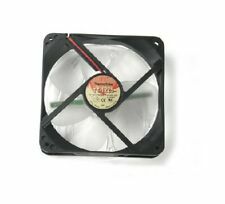 Product Type: Cooling Fan. Fan Information. Fan Speed (rpm): 1 x 3000 rpm. 8 cms 80 mm - Thermaltake - Modding. Ventilador Cooler - UV - Rojo Red Color. No están incluidos en precio del articulo y tan poco de envío. Thermaltake TT-8025A Gehäuselüfter A8025M12S 12V. 92mm Gehäuselüfter 92x92x25mm 92 mm Lüfter 3/4-pol Molex Stecker diverse ModelleEUR 1,1900. -> Netzteile. 2 x Low Profile Slotbleche Slot Blende zur Abdeckung für Gehäuse Low-ProfileEUR 1,7900. P/N: A1888. SKU: A1888. MPN: A1888. Manufacturer: Thermaltake. 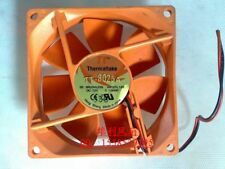 Product Type: Cooling Fan. Fan Speed (rpm): 1 x 3000 rpm. Fan Height: 3.15. Fan Width: 3.15. Der Lüfter hat einen 12V Molex-Stecker und kann somit direkt am Computernetzteil angeschlossen werden. Lüfter von Thermaltake wie abgebildet in neuwertigem Zustand und voll funktionsfähig! P/N AF0065. - A 8cm VR Fan can be adjusted between 1500rpm to 2500 rpm. - A powerful portable desktop fan cools off sweaty hands. Fan Speed 1500 - 2500 R.P.M. Life Expectation 30,000 hr. Thermaltake TT-8025A Gehäuselüfter R128025SM 12V. 92mm Gehäuselüfter 92x92x25mm 92 mm Lüfter 3/4-pol Molex Stecker diverse ModelleEUR 1,1900. -> Netzteile. 2 x Low Profile Slotbleche Slot Blende zur Abdeckung für Gehäuse Low-ProfileEUR 1,7900. AMD Athlon 64 (Socket 754 / 939). AMD Athlon 64 FX (Socket 939 / 940). AMD Sempron Socket (754). AMD Opteron (Socket 940). Silent Fan at only 19dBA. Heatpipe technology, transfers heat efficiently. Vortex fan grill with Tt logo. Perfect cooling performance with affordable price, and you can’t miss it. EASY INSTALLATION The Thermaltake A2376 features easy installation design so you can complete installation in minutes and go back to gaming combat quickly. 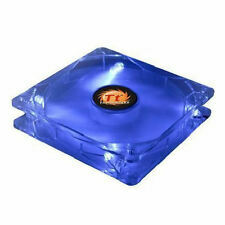 Thermaltake 80mm x 25mm IDE LED Case Fan. Item has been pulled from salvage machine so expect the item to be in a used condition with minor scuffs etc. There are only 4 MARs in the United Kingdom. Molex Female and Male connector. Sorry for the inconvenience. In excellent condition. Thermaltake TMG SL1 A2414 - PCI - System case slot fan - 80 mm - 16 dBA, 10.5 CFM, 1650 RPM. The Thermaltake A2414/SL1 dual PCI slot exhaust fan is a high efficiency low noise fan that pulls air from both sides of it’s housing for maximum cooling power. ThermalTake Model: DCFAN. If there are any problems, we are unable to follow up on progress because it has not been sent on our account, this will be down to you. Admin use: 42119. Rest of the World. StarForce fan in Green UV with UV LED, a mind-bending appearance. Unique StarForce design, inspire you from the traditional fan image. Smart StarForce Fan (2 functions in 1 ) THERMALTAKE StarForce Fan #2 With Green UV Twin Blade Fan A-2267.